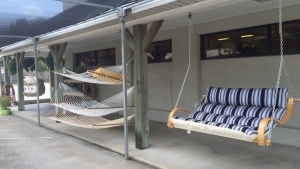 Forrest Farm Supply is now a Hatteras Hammock Dealer. We are excited to have in stock the original cotton Hatteras hammocks as well as the Duracord rope hammocks in single, double and deluxe models. Also, in stock are the Hatteras Hammock rope chair and the double swing. These items are made of tufted Sunbrella fabric. We have fabric samples if you would like to custom order the material which works for you. It will be a Next Day Delivery. Mention this post and receive a 10% discount on your Hatteras Hammock purchase. Stop and Shop Local. We appreciate your business!